The EU’s top regulator for insurers and pension funds, the EIOPA, wasn’t kidding when it warned that the ECB’s €60-billion a month money-printing and bond-buying binge was triggering treacherous “volatility” in the bond markets. “Volatility” isn’t actually the right word. It implies ups and downs. But since QE started in March, euro sovereign bonds have experienced a brutal rout, interspersed with brief periods of calm just long enough for investors to lick their wounds, followed by a brutal rout yesterday and today. Investors who’d bought into the ECB’s deflation hype and into the panic instigated by inflation-loving mainstream economists – including the folks at the IMF – and that the ECB would have to expand its QE program, and that interest rates would drop ever deeper into the negative to where everyone would eventually be paid to borrow money, well, those gullible investors who bought these bonds late last year or early this year, or even during the dip last week, they’re now getting their clocks cleaned. In April and early May, the rout produced losses of €344 billion on Eurozone-government bonds alone, according to Bloomberg. Corporate bond investors pocketed additional hefty losses. On a global basis, that first phase of the rout entailed $450 billion of losses. And this second phase of the rout adds to them. Deflation panics do that to gullible fixed-income investors. In his prepared speech, Draghi padded himself on the back for destroying savers and all kinds of other folks by imposing a negative deposit rate of -0.2% and initiating the €60-billion-a-month QE scheme. They’re already performing miracles on a daily basis. “The monetary policy measures we have put in place will support further improvements both in borrowing costs for firms and households and in credit flows across the euro area,” he said. “Therefore, it will encourage both households to expand consumption and firms to increase investment today, thus reinforcing the current cyclical economic recovery.” Inflation has been roaring back to life too. And so he said, there’s no need to expand QE. This must have popped a dream. But those hedge funds in the loop by yesterday morning had already started selling their holdings yesterday, or shorting what they hadn’t already shorted. So the rout in response to today’s announcement started yesterday morning. Today the rest of the market chimed in. The chart is as of May 28, and doesn’t include the bloodletting of the last two days, which would likely take the volatility measure of the German 10-year yield above 350. 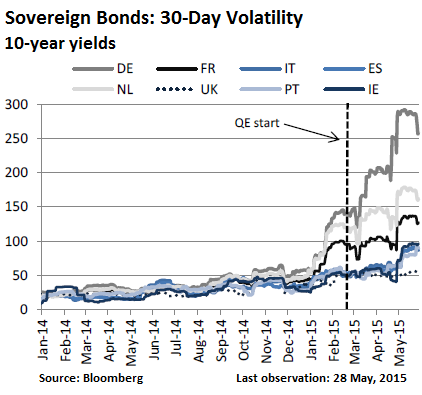 The bitter irony: Rumors of QE drove up bonds (and European stocks too!) all last year. The ECB’s January announcement of QE inflated bonds even more, with yields plunging to ludicrous levels. But upon the ECB’s actual kickoff of QE, bonds did the opposite of the expected: they sagged, and yields soared. So last week, the ECB rode to the rescue and announced that it would “frontload” QE ahead of the summer, which meant an additional short-term mini-QE. It stopped the bleeding for a few days, and bonds recovered some. Today the ECB popped the dream of an overall expansion of QE, and bonds got massacred. This sort of bloodletting is not what the ECB had in mind when it announced its QE and negative deposit rate. Yields were supposed to go lower. Bond prices, along with stock prices, were supposed to rise. But for now, euro bond markets are spiraling out of its control. Turns out, just as they were front-running QE for over a year, they’re now front-running the end of QE. And the purposefully fattened, deflation-hype besotted bond investors are stewing in their losses. Mario isn’t looking so super anymore, is he? Pssst – Mario is just waiting for direction from the muppets masters handlers at Government Sachs. BTW Mario used to be vice chairman and managing director of Goldman Sachs. Yep the muppet masters must be giddy having made a fortune by suckering in the lemmings under all clear QE deflation inspired bonds are no brainers all the while shorting the EU bonds. QE in a monetary union just isn’t quite the same as QE in a monetary/fiscal union is it? wasn’t this true of US QE programs that once initiated rates began rising ahead of the communicated termination of the program? It was only the implementation of a program of shadow QE via the “BLICS” since July ’11 onward (and currency swap-line nations since) that has allowed the Fed to taper QE without the 100% economist expected rate rout)? Once the Fed created false demand for real supply of debt at yields simply not investment worthy, false demand would always be necessary to maintain a “market”. My best guesses at that false demand in the following links. Perhaps fair play will dictate the US initiating currency swaps to become the new primary buyer of EU bonds allowing ECB to taper down and maintain near record low yields??? Some day soon the common people will get tired of being robbed of their life’s savings. Then it will be the Bankster’s and market manipulators turn for tar and feathers. Maybe they should buy stock in guillotines? Mario is just a small cog in the system. His behaviour in front of the female activist shows that he is a man of no substance. Imagine the garbage he must have swallowed over the years to sit where he sits now. I wonder if it has been worth it. I think maybe that this is all planned rather than a loss of control. Look at things from the ECB’s point of view- they had initiated QE with yields at all time lows, indeed ridiculous negative yields in broad swaths of the bond market– a market the various member state CBs were being directed to buy into. So, what is a central bank to do? Do they just buy the bonds at all time highs? Or do they, instead, try to engineer a panic that at least lets them buy some of the initial tranches at positive yields, even if still low?